"Do you know you talk a lot about food and weight?" My recovery from active food addiction started with those words from a friend. Since I wasn't aware, I answered, "No, I didn't realize that." Then Janet asked another question: "Do you know there is a Twelve-Step program for that problem?" I didn't know that, either. She invited me to attend. Well, it was November, and no food addict in her right mind would consider going into a recovery program before the holidays. No, indeed, I would wait until January to start anew. I was no dummy; I had lots of holiday eating to do! I don't recall the holiday festivities that year, but I do remember that I purchased a box of candy for my father for Christmas—then ate five of them before the gift got wrapped and delivered to him. As I was walking from the bedroom, where I had hidden the fifth box of candy in my bottom dresser drawer, to the bathroom where I planned to eat it, I had a thought. Why didn't I put this box of candy out on the coffee table and share it with my family? That was my moment of truth. There was something very wrong with bedroom storage, bathroom eating. And I felt so selfish that I had not shared. This behavior was not new. Oh, no. I had spent my whole life buying treats for others and then secretly eating them all. Why, I was so good at hiding my eating that my husband commented, "I don't know why you have a weight problem, you eat like a bird." My secret eating of sweets started at a fairly young age. As a small child, locked in the pantry to avoid detection, I would squeeze chocolate chips out of a tiny slit in the corner of the bag. Quietly opening the refrigerator, I would run my finger around the edge of the cake, collecting as much frosting as possible. All my nickels and dimes traveled to the corner store with me for sweet purchases. We had two corner stores, and when I got old enough to cross the street, I could get to the second one and buy ice cream cones dipped in chocolate sprinkles. What an innovation! When I found a dime at our vacation cottage, I talked my sister into rowing our boat miles to a concession stand to buy candy. I wonder if I shared with her. Holidays were heaven! We got huge baskets filled with treats at Easter. We baked special family recipes at Christmastime. We decorated cakes for every occasion. I was obsessed with food. By the time I was in eighth grade, I was fat. We had to shop in the "chubby" clothes department. My mother dressed us beautifully, and she really had to search to find appropriate clothes for me. I started cooking about that time, too, making meals for the family. I just loved to be around food. By the time I was in high school, I was a talented pastry chef. I planned to be a dietitian when I grew up. I didn't really know what a dietitian was, but I figured it was about food and that would be great. I never did follow through on that idea. At age fifteen, I went on my first diet and managed to lose twenty-two pounds by eliminating sweets and starches. This was the first of many attempts to lose weight. Around that age I started smoking my dad's cigarettes. Within a few years, I started to drink alcohol. None of these addictive substances seemed to be out of control, but I had three of them operating: food, nicotine and alcohol. Everything appeared to be manageable. I had no idea about the progression of addiction; I was in the early stages and poly-addicted. Alcohol was the first to become unmanageable. Not that I noticed. Denial took care of that. I was a binge drinker with a pattern of disruptive incidents followed by long periods of abstinence from alcohol. I would smoke and eat through the dry times as I got my life back together. My losses from alcohol mounted: my college education, a marriage, several jobs. By the time I found recovery, I had been institutionalized and separated from my young son. In 1967, I got sober and began working a recovery program. My son and I were living with my parents. My mother asked me if I realized that I ate the whole pan of brownies every Sunday. It must have been noticeable that I was an automatic eater without awareness of my actions. For the next ten years, I would rely on food and nicotine as my major addictive substances. During that time, my mother died of the complications of her own food addiction. She said to me the year before she died, "For the rest of my life I am going to eat the way I want to." She was surrendering to the disease. She told me that she had "given up." Mom died at age sixty-five. I had always been aware of her struggle with food. We began dieting together when I was fifteen. We tried lots of diets, drugs and programs. Nothing had worked for us. In 1977 Janet introduced me to a recovery plan for compulsive eaters. I just loved it. Although I threw myself into the program, it would take several years in recovery before I realized the extremely serious nature of this disease. At first for me, it was mostly a weight-loss program and fellowship with people I really liked. My sponsor guided me for the first nine months of my recovery while I completed the first Three Steps. Then she got busy in graduate school, and I neglected to find a new sponsor. We moved to the country and I was no longer as connected with my recovering friends. Fewer meetings, fewer phone calls, one too many resentments, and I was back into the food—for one binge! That was enough to show me that I was as crazy on food as I had ever been on alcohol. It was time to get serious about recovery. I began to attend many meetings and moved forward in my Step work. It was no longer a weight-loss issue, it was a question of sanity. After attending graduate school, I went to work as an addictions counselor in a treatment center where there was a food addiction unit. In the therapeutic community, the intense pain caused by food addiction was more apparent than in the meeting rooms. My eyes were further opened to the serious nature of this disease. I learned a lot about food plans and addictive foods there, too. Two years later, I went on to open several food addiction programs in hospital settings for another company. It was difficult to find support for abstinence in my new location. Because the major recovery program had stopped using food plans and effective guidelines for abstinence, members were not in stable physical recovery. It was frustrating, and sometimes I left meetings feeling defeated. Eventually, abstinence-based recovery took root in the community. Over the years I collected a lot of information about food plans and addictive foods. Most of it came from recovering people. Many professionals offered good ideas, too. Developing an effective food plan has been a work in progress. Scientific research is catching up with us, but our best information comes from realizing what substances or situations trigger our craving. The body knows. What the body knows is this: It is sensitive to addictive substances and will always, without exception, react in an addictive manner to them. 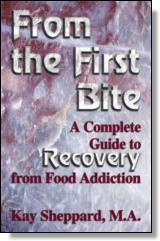 A great gift of recovery is relief from craving and obsession triggered by food substances. In 1988 I quit smoking, and I spent the next two years suffering from acute and post-acute withdrawal. I relied on my sponsor and the God of my understanding to get through it. Others who had agonized during nicotine withdrawal assured me, "This too shall pass." I didn't believe it, but I didn't think they would lie, either. One day at a time, I did not pick up any addictive substances. Nicotine was the last of my addictive substances. Without it, I had to watch my food carefully. I learned about discipline, obedience, commitment, vigilance and resolve. Alcohol, nicotine and caffeine were never in my home. However, I still had to prepare and eat food. Over the years the food processors introduced sugar and refined starches into foods that didn't need them. One food distributor told me there was a "conspiracy to get as much sugar as possible into food so that people would buy more." It became even more important to check labels. My recovery was strengthened. It was important to trust God, keep my side of the street clean, help others and work the steps. Food was a greater challenge than it had ever been before. Today, I continue to weigh and measure my food, plan it daily and report it often to my sponsor. When attending a social event that includes eating, I eat beforehand, take my food with me or call ahead to arrange for abstinent food. Planning is the key to physical abstinence, and for that I am responsible. I do not just "show up" and expect others to have abstinent food waiting for me. For example, recently I did a workshop in south Florida. I took my food for the two meals I would need on the day of the program and spoke in advance with my host to arrange dinner for the evening before the workshop. I was served acceptable protein and starch but had to request another vegetable. The salad served contained cheese and bacon, neither of which is on my food plan. Assertive, not aggressive, requests usually result in great cooperation from servers, friends and relatives. My relatives are familiar with my abstinence, and they are so cooperative. My sisters always have my kind of food available when I visit. My brother picks me up at the airport and pulls into the grocery store before we get to his home. "Get the food you need," he says. In restaurants I order dry, broiled protein, a dry baked potato, a large salad (no cheese, bacon, croutons) with oil and vinegar on the side, and water to drink. I don't use balsamic vinegar because it contains sugar. I don't use table salt because iodized salt contains sugar, too. When traveling I have all the food I will need on hand until I can get to a grocery store (every city, foreign or domestic, has one) or restaurant. I plan my travels meal by meal. I carry my scale and some condiments in my purse. I seek objective feedback from my sponsor when I get into personality conflicts. I am willing to follow directions. Being openminded is so much easier than suffering. I have learned that whenever I judge, criticize, blame or put expectations on others, I become a helpless, hopeless, powerless victim of my own creation. I create my own pain, my own victimhood. When I want out of it, I do my work—which is to suspend judgment, give up expectations, stop blaming and get back to a place of love and acceptance. I call my sponsor occasionally, and I sponsor others. I attend meetings, usually daily. My goal is to do Steps Ten, Eleven and Twelve every day, always remembering the First Step—that I am powerless over certain foods. The literature is important to me. In the morning I meditate, pray and read. In the evening I inventory, journal, resolve personality conflicts and do a gratitude list. When I am wrong I admit it, not always promptly, but it is always a relief when I do it. It takes so much energy and causes so much anguish to be "right." I understand the false idea that "I am right, you are wrong, you had better change!" causes all the fights, war and conflict in the world. By giving it up, I can resign from the conflict and enjoy peace. I would rather be happy than "right." In the world of the spirit there is no right/wrong, good/bad, could/should, only love and acceptance. That is where peace is found. You can't keep it unless you give it away. Love and service are the recovery principles embodied in Step Twelve. I sponsor others, make phone calls, share at meetings and carry the key to the meeting room to ensure that the door will be open to every food addict seeking recovery. E-mail, chat rooms and our recovery loop provide opportunities to share on the Internet. God's grace pours down upon me. All I have to do is say yes to all that he provides. He sent me countless people to help me; some told me about recovery, others taught me to meditate, still others showed me that I am the author of my own life. God's grace is always available to me, as I seek this day's reprieve from addiction. Coasting does not work. I cannot stay abstinent, clean and sober by putting anything before spiritual growth. Pain sends me scurrying for help. A very spiritual man taught me how to use pain as a spiritual path, but pain is not the only way to grow spiritually. The Twelve Steps show me how to bring my will into alignment with God's will. That is the direction in which I move. As my recovery progresses there is more of God, less of me. God is my home, and I have been moving homeward for years. (c)2000. All rights reserved. Reprinted from From the First Bite by Kay Sheppard. No part of this publication may be reproduced, stored in a retrieval system or transmitted in any form or by any means, without the written permission of the publisher. Publisher: Health Communications, Inc., 3201 SW 15th Street, Deerfield Beach, FL 33442.